Amy is watching Last of the Mohicans in the other room with the kids. We started it last night after Ulysses’ basketball game. Pizza, carrots, Mohicans and then early to bed. After breakfast, we went on a hike in the Franklins with friends and dogs. Glorious morning in El Paso, crisp and clear, you can see for miles at the top of Crazy Cat. Listening to the war cries and shots firing from the TV speaker in the other room, I’m smiling because we are all together again. Doing something — just hanging out, just being around, just being — that I haven’t done in almost two years. Been to all the kids’ games over the last few days, made dinners at home, seen some friends and got to be outside, on the mountain and down at the river with Artemis. And Henry saying “I’m watching it!” and laughing. Already miss the road. Miss our team and the volunteers we’d see in every city, every town. Miss the energy and smiles and joy that I found all over Texas. Miss the purpose, the goal. Miss being part of something so much bigger than me or my life. Organized for a common cause and end. We were all together, really together. Never felt anything like that. While there is loss, I also feel intense gratitude, waves of it every day. How was I so lucky to be part of something so amazing? I can close my eyes and see so many faces and smiles. Hear the laughing and the cheering. I can see us hopeful and connecting as we shook one another’s hand, looking at each other and nodding, knowing. All the stories that have been shared with me, all part of me. Every gift and kindness, every word of encouragement. Every bit of faith in what we had set ourselves to. We were doing this for one another, doing this the right way, doing this for our country at what we all know to be a defining moment of truth. The loss is bitter, and I don’t know that I’ve been able to fully understand it. I try not to ask what I could have done differently because I don’t know that there is an end to those questions or thoughts. There are a million different decisions I could have made, paths I could have taken, things I could have said or not said, said better or differently. I did my best, everyone did. For our democracy to work, for us to be able to continue to work together, it’s important to be at peace with the outcome. But what remains is this: I’m the luckiest guy in the world to have had the chance to do this with you. To bring power and joy to politics. People instead of PACs. Communities instead of corporations. Polls and consultants left to the wind and hopefully to the past. To have the confidence to move with the courage of our convictions. To open our hearts to one another. To not allow our differences (of party, of geography, of race or anything else) to divide us. To not know how it would end but to know that we had to give it everything. I don’t know how to fully make sense of what remains or to measure the impact we’ve had. Certainly, we changed something in Texas and in our politics. At the very least our campaign reflected a change already underway in Texas that hadn’t yet been seen in statewide campaigns. Future campaigns will be won, influenced by the one we built. Candidates will run who otherwise wouldn’t have. Some will take heart in knowing that you don’t have to accept PAC money, you don’t have to hire a pollster to know how you think or what you want to say. They will have seen in our campaign that there is real joy and power in being with people, all people. Republicans, Democrats, Independents. People who’ve never voted and never will. People who will vote for you, people who won’t. People who live in the forgotten neighborhoods of the biggest cities. People who live in small towns that no Senate candidate has been to in 70 years. I am grateful that you gave me a chance to be part of this. I feel responsible to you, to our country, to my kids and to my conscience to make sure that we continue to find a way to respond to the urgency that we still feel. It didn’t go away Tuesday night. Our ability to convert hope and inspiration into action and change must not be wasted or kept to a candidate or campaign lest it dissipate and be rendered unusable at the most challenging time in our country’s history. Just know that I want to be part of the best way forward for this country — whatever way I can help in whatever form that takes. Know that I am honored to have run this campaign with you and that I want to continue to honor and be honest to what was powerful about it. For the time being, I am going to focus on being a better dad to our kids who have not had much of one for the last 22 months. Movie is over. Now going to Molly’s basketball game and then we’ll see what’s next. Grateful to you for being a part of this, for giving me a chance to be a part of this. 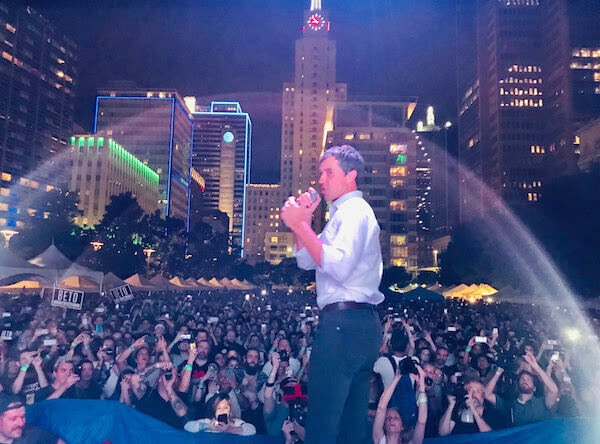 Tandem Donate to Beto O’Rourke!